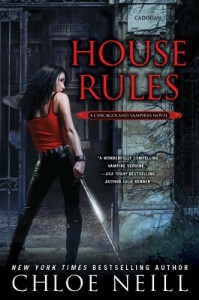 This is a solid new installment in the Chicago vampire land series if not the best book so far .It sucked me right in on the first page, it is so well written the words just flow on the pages and paint wonderful scenes in your head that come alive; you almost smell what they smell. You feel what they feel and I went through the scale of emotions like a role coaster ride during this book, from pure joy and ecstasy, anger, terror, sadness and total bliss. It has pretty much everything and I was sitting on needles the whole book and could not put it down. If is full of the lovely snark we all love and quick witty dialog. The chemistry between Merit and everybody’s favorite vamp is wonderful and steaming hot they are getting along in their relationship, not smoothly but with bumps and some fab makeup scenes. They now have a relationship and are living together, FINALY!! The snake in the paradise is back, one master vamp Lacey Sheridan now all dressed up like a Merit lookalike. Seriously I was snickering over that. The plot was wonderful and had me on edge the whole book, it dealt with two things the GP and a murder investigation. With the GP out of the house I see a new interesting new line, maybe Amit Patel turns up, in a future book. He has stayed far away from the GP and house so maybe we get to meet him in the future. You got some Jeff, Mallory, and Catcher in it and there are some great scenes with Lindsey and Luc too. We finally get to know what Jeff turns into, but I am not going to tell you. Merit revealed a little of what see saw in Gabriel’s eyes/prophecy. Do I see some foreshadowing there? I sure think so. I can hardly wait to get my hands on the next book Biting Bad that is published in August 6, six more months to wait.. I just loved this book and I am giving it 5 stars.